Is anyone else out there watching "The Office" on TV? Not the British one, but the American version -- for some reason I am hooked. Too funny, maybe because I used to work with people at one time or the other like the characters in the show. I'm really glad I have my own business now, let me tell you! 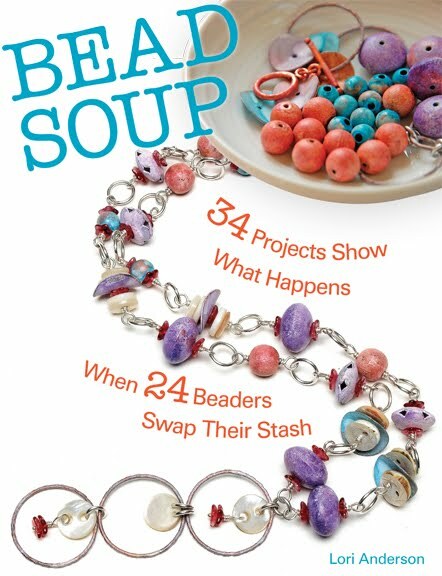 Yesterday was fun -- my beading buddy arrived with her two kids and we spent the day together. Took the three kids to Guppys to play and burn off energy, chatted while they napped (oh wow, adult conversation, not "No" and "Stop that" and "Don't climb on the cat"!). Then Rick came home and fell in love with her 10-month old daughter and we had a fun family dinner before they got back on the road. Speaking of road -- cost $50.00 to fill the tank today so I am seriously curtailing my trips over the bridge. I have one already planned for next week but I now think twice before just popping over. Rick drives over 60 miles each way, with our old Mercedes with the V8, so he may be rethinking the work hours. I really wish he could work closer to home, but housing closer in is insanely expensive and we want for me to stay home and be there for Zack. 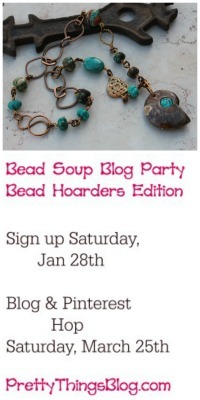 I'm so excited -- I get to meet one of my internet beading buddies tomorrow! She's driving quite a long way with her two kids to come play at Guppys and then just hang out, have dinner, before heading back. VERY excited. Reading a new book, started it last night -- Tomcat In Love by Tim O'Brien. I'm interested immediately because of his humor. I ditched the book I started over the weekend, Dupont Circle -- it just plodded and I couldn't get into it at all. Which is a shame, since I have shopped Dupont Circle in Washington DC many times and thought it would be neat to read about places I've been. Not much to write about today -- have to get back to the beading table. Four shows remaining for the year, three of them major, so I have to get inventory for the web site as well as for the shows. What a fun weekend! Rick, Zack, and I left for Pennsylvania on Friday for the Shippensburg Corn Festival. Last year, it was about 100 degrees outside. This time, it was overcast, intermitantly drizzling, and cool enough that many wore sweatshirts. But I'll take that any day over heat! The weather certainly didn't keep people away -- if anything, it improved things. People weren't so miserably hot that all they could think of was getting indoors, and the early-birds were out in force. A number of folks who had purchased last year were back (thank you!) and I met so many terrific people! Sales were almost triple what they were last year, so I will absolutely be back next year. It also gave Zack a chance to hang out with his Grandma and Grandpa Anderson, and Uncle Rusty and Aunt Cindy. Rick's family lives on a farm -- Rusty and Cindy farm the land, and Rick's parents and Cindy's parents live on the land as well. Zack loved seeing the cows and the dozens of hummingbirds that were a constant fixture on the front porch. And he and Spice the Cat made meow-music -- meow for meow they talked to each other. And to end this blog on a sweet note, take a look at my two favorite guys in the entire world. 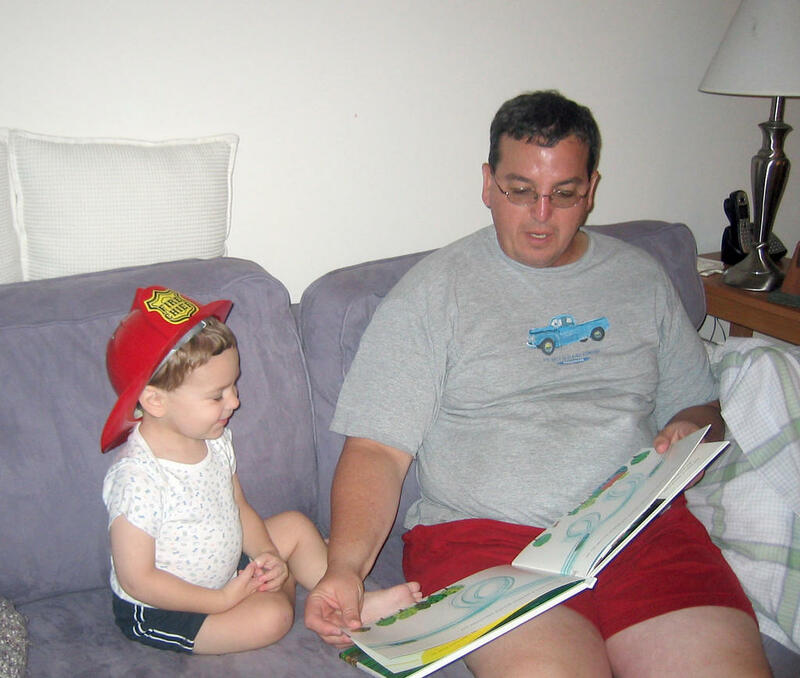 Zack loves to be read to, and no one is better at it than Daddy. Opened a bottle of bubbly tonight as a special treat -- just to celebrate life. I look at all I've been through in my life and I realize, things are pretty darned good. I have a wonderful husband, an adorable baby, I'm out of the rat race and doing a job I love, and have great friends who I truly love and appreciate. I joined the military right out of high school and immediately got thrown into a world that was a million times different than what I'd planned on. All my life I planned on going to college and following the same path that everyone else did -- but fortunately, Someone Else knew best and I ended up a linguist for the Air Force in Korea. I met some of the best friends, had some of the best times, all in an environment completely different from the norm. At the time, of course, I didn't quite realize that I was actually really lucky. I may have made a major detour on the road to college (finally got to go -- graduated University of Virginia in 1997, Biology/Pre-Med) but oh what a trip it was! I have volumes of photo albums from all my travels -- Korea, Japan, Italy, Luxembourg, Germany -- and memories that will last a life time. I'm still in touch with a lot of the people I served with (one just came and visted for the first time in 15 years) and my life is richer for all the different experiences. I didn't always know it while things were happening, but in the end, everything happens for a reason. So when minor annoyances in life come about, all I have to do is look back and realize, none of the small stuff matters. I can look in on Zack while he sleeps and know that there are so many more important things in life, that I am so lucky to have the life I have, and that God and Karma work in mysterious ways. So have a drink with me and live your life well -- Karma, baby. What goes around comes around, and I sleep well at night knowing that. Today was a LONG day for Zack. He is tongue tied -- the frenulum that attaches the tongue to the bottom of the mouth is too tight, and it makes it almost impossible for him to make certain sounds, and is therefore making speech tough. He talks all the time, but he's hard to understand. We had an appointment at Johns Hopkins Medical Center (an hour and a half drive from home) at 12:30 -- right when Zack is set for a nap. TWO HOURS LATER the doctor sees us. And oh is Zack not happy. And then another doctor sees him. Tears all around. Bottom line, though, is he will be having the minor surgery needed to clip that tight part -- he'll be under only about 2 minutes. I am so not looking forward to them putting needles in my baby's arm but I know this is for the best. Heaven knows we've had enough opinions from doctors and speech therapists. On a sunnier note (and thus the smiley face!) -- I just packed a 3 pound box of jewelry off to a super customer (thanks, Andrea!). I should have been making more things for this weekend but I had an application for spring shows due and my slides just arrived today so I got that all done. As soon as the slides come back from being made digital, I'll post them on the web site. Robert Diamante is magical with a camera! Thank you to all of you who have been sending me emails recently -- I appreciate all the kind words and support for Zack! "The Bowl is Full" means web update time! 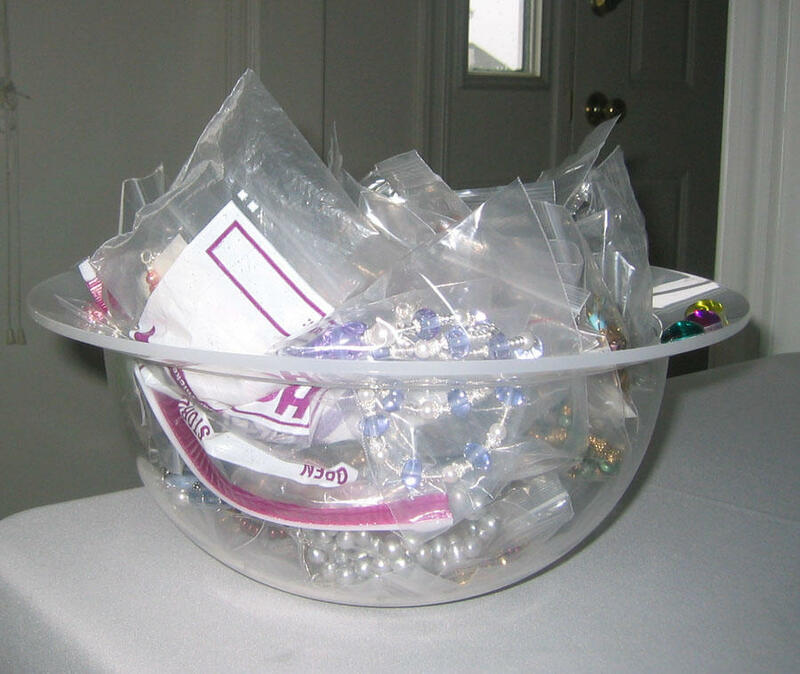 When I make jewelry, each piece goes into a plastic bag and then is put in a big bowl I keep on my beading table. When it's full, it's time to put them on the web site! Just got everything posted, and will be sending the newsletter in a few. Then tonight it's on to filling some custom orders that came in last night, and preparing for the Corn Festival this weekend. 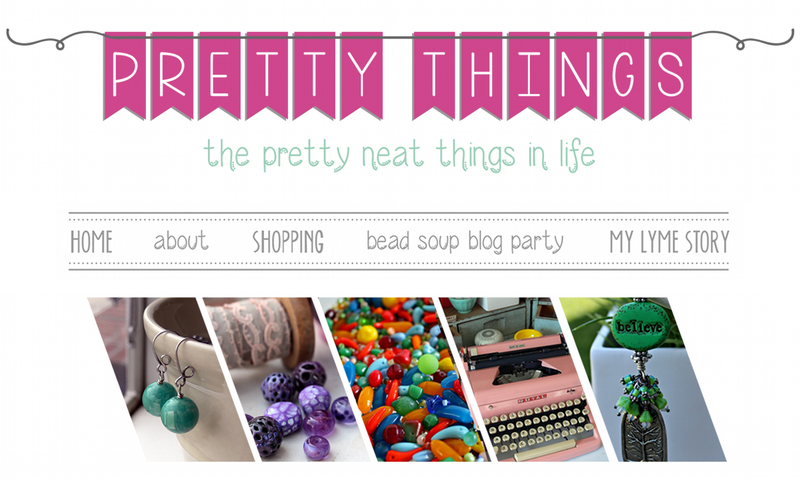 This weekend was terrific -- I had three customers come to the house on Saturday to go through all my jewelry, and I had a great time customizing things, making matching earrings, and having the chance to show things that aren't on the web site. If you're ever in the area, give me a call and come out to look! Success! After two horrible hair cuts, I finally got a good one! Yippee!!!! And it cost a lot less than what I'd been paying for being butchered. 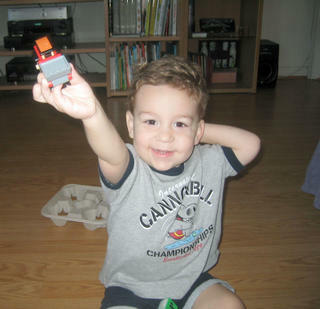 As promised, here's a picture of Zack's new haircut -- he's proudly showing you Jack the Steam Shovel, his latest addition to his vast Thomas the Tank Engine train collection. Glad he was all smiles in this photo because today he was most definitely not all smiles. Crabby all day -- yikes. And Dad is gone tonight with Colin at Yale, which I'm sure has a lot to do with it. Got some pretty jewelry made tonight -- some delicate chain earrings with crystal, two wonderful chunky wire-wrapped necklaces, and I finally got out a packet of rare Vitrail Light Swarovski crystals. Vitrail Light is one of those colors that looks best in large crystals, and it's not a color available in many things anymore. I got some 8mm cubes and some 12mm bicones -- woo hoo! Took Zack to get his curls trimmed -- man oh day. Let's just put it this way -- I gave a ten dollar tip for a $14.00 haircut! I'll have to corner him tomorrow and take a picture -- he's utterly adorable. While waiting for lunch time, we stopped by Bailey, Banks, and Biddle jewelers. I only intended to get my ring cleaned, but while I was waiting, I started looking at other rings. I've been on the search for a Right Hand Ring for some time now. I wasn't entirely sure what I was looking for, just knew I'd know it when I saw it. Found it! This gorgeous milky aquamarine ring -- my birthstone, so it seemed perfect. It's unusual without being TOO unusual, and of the four or five rings I tried on, Zack approved this one! I couldn't believe how quiet and content he was at the jewelers, but it could have had something to do with the lollypop he got at the hair cutters. Still can't believe I bought it. Rick is taking Colin to Yale tomorrow to start his PhD program (Physics) and tomorrow my friend Kiersten is coming over with (I think) six kids to play with Zack. Then *I* get to go get my hair cut at 4pm -- hopefully third time's the charm, and I'll get a decent cut! It's been an amazingly busy week! I've been working on a really large order all evening but did manage to make some things for the next update -- got some fabulous (and rare) rainbow calsilica, some sweet lampwork hearts, and a lot of fall colors. Tomorrow Zack and I head across the bridge to get his hair cut at Cartoon Cuts -- I hope he does better than last time. It's a neat place where he can watch Thomas the Tank Engine videos while getting his hair cut, but sometimes, he just is NOT in the mood. The mall is really cool, though, with a full-size carousel in it, and we'll be hitting that as well. And of course, my favorite, STARBUCKS! I love how eclectic they are! And these are so not my colors -- well, the purple is, but I was looking for a set that was a total mix of colors and patterns and textures. Be on the lookout for more new jewelry very soon on the What's New page -- a lot has already sold so I'll go ahead and post more before the next official update! one day closer to the weekend! Been busy tonight -- filling orders is a lot of fun, especially special orders for dichroic glass pieces. I usually do those during the day since the colors are easier to match to crystal in daylight, so those beauties are waiting for me first thing tomorrow morning. The Zack-man is so cute. He has known his letters for a long time, but today at the library we got a DVD for him to watch that teaches the letter sounds, so he can start associating them and be that much closer to reading words. His favorite letter, unsurprisingly, is "T", for train. He sees the letter T and he goes, "T! CHOOO CHOOOO!" Off to bed -- starting a new book I got at the library -- a collection of short stories whose title escapes me right now. I grabbed it without much thought, as I'd forgotten to bring this huge list I keep on the computer of books I want to read. Anyone else think that heaven is a big Barnes and Noble??? I am so ready for the weekend, aren't you? My friend Kiersten and I are heading to Delaware on Sunday to go to a bead show -- hope to find some great pearls and gemstones there. 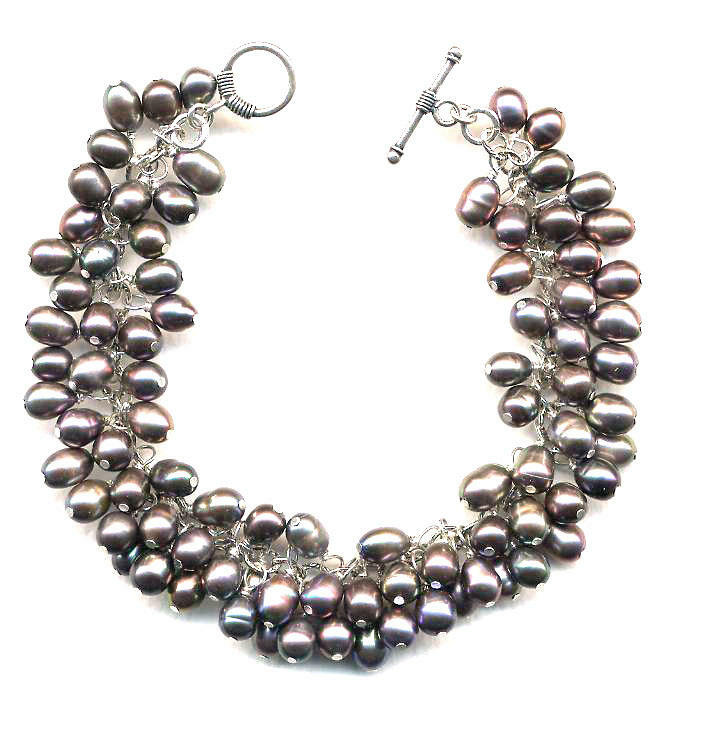 I am woefully low on pearls and I really like to take a look at those in person. They vary so much from strand to strand, as do gemstones, that it's tough to order sight unseen sometimes. The update was posted on Sunday and so many things were snapped up this time -- thank you! It's so much fun to do this job -- well, it's not really a job, it's a lot of fun that just happens to help my little guy's college fund. And it helps keep brain cells firing when I've been watching Thomas the Tank Engine all day long! First and foremost, the web site is being updated this weekend -- so if you are reading this, you get a sneak preview and first dibs at new things before I send out the official update! And for those of you who are following the Woeful Tale of Lori's Hair -- after Rick laughed at me last night (remember, HE picked the color) I told him I wasn't stepping foot outside the house until he went back to the store and bought me "Chestnut Roast", which is what *I* had picked originally and should have chosen all along. Well, he was great (he really is, just color blind) and the box was waiting on the bathroom counter when I woke up. So even though I just colored last night, I did it again. EXCEPT, the Crushed Garnet was so intense a color (duh, no kidding, right?) the Chestnut Roast just toned down the red. So now I have artsy burgundy hair for a while. Sigh. And I have a friend who hasn't seen me in years coming to visit on Monday. Oh well, if I *act* cool enough for this hair, maybe it will all be ok.
At least I'm not glowing and visible for miles around. What is my plan for this weekend? 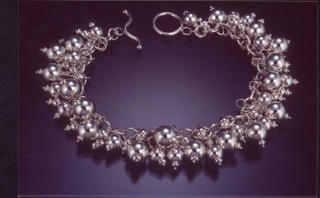 Make jewelry! It's too hot to do anything, the beach traffic still snarls up any plans to go anywhere at all, and I really, really need to catch up -- especially since I just spent almost 2 weeks working on a large special order for someone who unceremoniously canceled this morning with no explaination. I try to have the best customer service around, but I'm going to have to start getting prepayments for special orders -- I can't have this happen again! Oh, and started a new book last night -- Michael Connelly's The Closers. I've read all of his books and this is another Harry Bosch book and so I'm hoping it's as good as the others, but it either starts slow or I was just too tired last night to enjoy it. Ah, and something I just learned in the past half hour -- NEVER let your husband pick your hair color. I now have burgundy hair. Sigh. 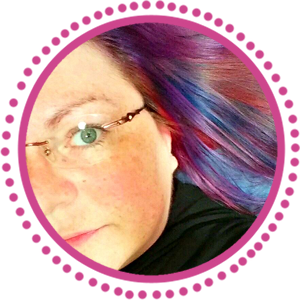 If you've been a reader of my Blog for a while, you know I have NO luck with my hair. I guess I should have read the box of hair color, rather than looked at the picture -- "Crushed Garnet" should have been my first clue. All I said to my husband was that I wanted to get RID of the red and go back to my natural (dark) color. Now I have what I've always considered "Artist" hair -- a great, funky color but so NOT me. Dang him, he actually laughed when I walked in the room. Heading out of town for a few days -- since I can't take my entire bead collection with me (the van's not big enough!) I'm going to work on a very time-intensive bracelet that I just love.... all silver, and it makes a very satisfying sound when you shake your wrist, which is why I call it "Jingles".